children's literature reviews, mostly. occasional thoughts, commentary, and whatever else fits the kidlit bill. Yup, that just about sums up what's going on here, proving the Einstein's smaller theories were pretty solid as well. The physical world and its inhabitants are once again anthropomorphed and grouped by association. We get the Old School dudes (Mass, Weight, Density, &c.), the Hot Stuff (Energy, Entropy...), the Wave Gang (Sound, Frequency...), the Light Crew (Radio, Microwave...), and so on. It's all here, each aspect with its own spread, a first-person breakdown on the one side and a graffiti-like cartoon portrait on the other. There's also a "first discovered" box and a short historical list of how or when they were famously employed. As with the Periodic Table: Elements With Style, I think this book works best in the classroom as a supplemental text (though used correctly they could be primary) with wide appeal. 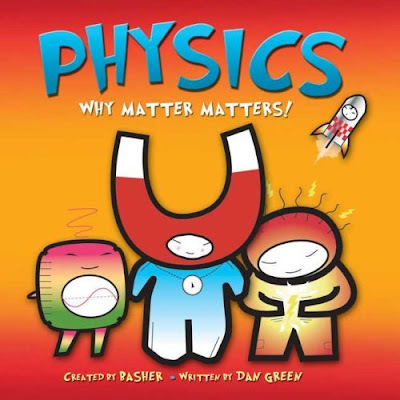 A great introduction for budding young scientists to the basics of physics, a playful refresher for older young scientists, and an easily digestible crash-course for adults who need the background to keep up with their budding young scientists. In a semi-related note, check out what happens when the Periodic Table meets Art. Courtesy of Sara over at Read Write Believe. Thanks for this, David. It's the only review I've read of the book since it came out. My kids love "The Periodic Table", which I helped get (it didn't need much help, though) on our Cybils nonfiction shortlist.